Have you ever bought something that maybe you should have just turned and walked away from? Well, for me this was one of those deals. Like so many other bikes that I have owned, I bought it for the wrong reasons. Yup, I felt sorry for it. You would think after all the bikes I've bought and sold I would have learned not to feel sorry for an inanimate object. Well, my wife would be the first to tell you I'm still learning. 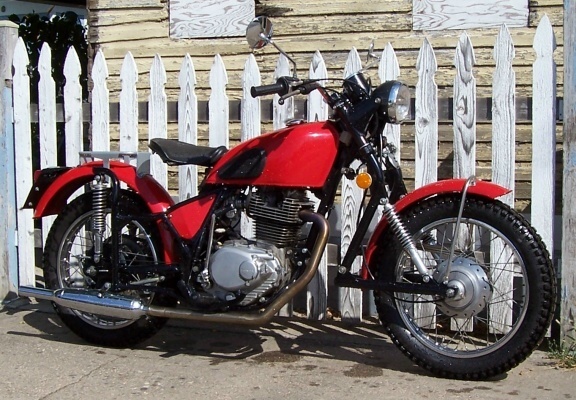 The X-Bike started life as a 1978 Honda XL 350. 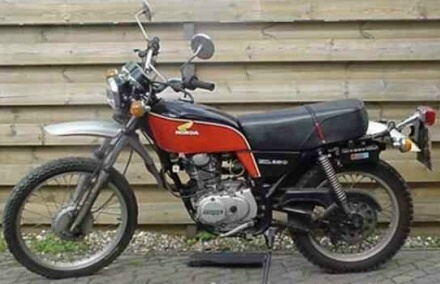 Before I became the proud owner, X-Bike obviously had a hard life. You name it, it was either worn out, bent or broken. I have an attraction to singles and this one obviously needed a better home. There was a considerable amount of discussion before a deal was struck and the XL came home (riding it home was a bit of an adventure itself). I was having trouble with my camera at the time this bike came home so no actual "before" photos of the bike exsist. This photo is only representative of my bike the day I bought it. This bike is actually owned by Rob Sterkman. My intent when I bought the bike was to use it as a base to build another "style" of bike, one that better suited the way I felt a bike should look. Being a sidecar freak, I thought it would be fun to build the bike to be able to pull a small sidecar as well. I tried a number of experiments with this bike. Somtimes I'd go charging off in one direction only to have to come back and go charging off in another. With the making and changing of so many parts (including wheel sizes), the most difficult part of this project was keeping the engine label, fuel tank bottom seam and fender rack all level. I don't like to admit it but having X-Bike in boxes for so long, there were even a couple of times I needed space badly enough to actually consider hauling lock, stock and barrel off to the landfill. Not long ago I needed to have the rack for my Harley powder-coated. To do one part would have been expensive, so I grabbed the frame, swing arm and forks from the X-Bike and had them all powder-coated too. It was this move that again gave me the impetus to carry on with the project. After several years of "adjusting" to suit my desires, then another ten or eleven years in boxes, the project was once again on the move! The photo below is X-Bike. Any part of the bike that doesn't look like the bike above, I made. Yup, everything from the forks to the rear tail light mount, all hand made. In the photo below the exhaust pipe looks a bit discolored, this is because it is made of stainless steel tube I secured at the local scrap yard. Each time I try to make it look pretty, one run of the motor causes it to again change color. Before I had a chance to deal with the sidecar, X-Bike was sold. I hope the new owner enjoys X-Bike as much as I have.